Is it really over? Fashion week fatigue usually sets in by day three depending on your commitment to it (and your overall physical stamina), but this week seemed more tired-making than most. Perhaps it’s all the throwback ’90s vibes, a decade we barely seem to have left behind only to be submerged beneath again—earlier this week The Cut remarked upon the prevalence of the ’90s spaghetti strap dress, once the domain of Kate Moss and pre-Goopy Gwyneth, and all we could do was sigh, like… again? But at least we haven’t been relegated to another year of space material and club-kid shoes. Or have we? At least some designers were looking past the ’90s, even if they were still mining the past. The Blondes popped out Barbarella babes in sparkling leotards with Vegas-diva boa arms and silvery ray-guns, suggesting that if there is alien life out there, the other/better universes will be run by Amazonian divas and drag queens. And Jeremy Scott went for a full-fledged, early ’60s Jetsons-meets-Mars Attacks! look, referencing both the groovy design elements of that era while also touching on Memphis Design of the 1980s, while Betsey Johnson’s punky pink tulle skirts brought us back to the Lauper era, a super-loop of ’50s informing ’80s informing ’10s and back again. There have been some standouts over the past couple of days, whose ideas transcend time and trend. Luar Zepol, the forward-thinking unisex line from Raul Lopez, mined his childhood playing paintball in the Dominican Republic for inspiration. Using denim and nylon in particular, he built in backpacks to utility vests and made creative-functional look like the most crucial element of any 2014 garment. It wasn’t apocalyptic, per se—even with a foreboding soundtrack from Gatekeeper, the clothes were too bright and spritely to seem like he was conveying endtimes. But let’s just say we’re going to feel like we’re missing something if our next pair of pants doesn’t have hooks on the legs for rappelling, or whatever other wild thing we might have to do next spring. And it was another play on the most interesting theme this week: activewear as the new uniform, a refreshing break from the delicate frills and fabrics that so often grace the Spring runways. And of course, there were parties. At Luar Zepol’s, held at Opening Ceremony’s pop-up shop on the Hudson, Lopez’s Dominican-American sistren Maluca popped in for a surprise performance, dropping not only Mala classics like “Que,” but a new pop number produced by Bangladesh, and ensuring more future bangers. And A$AP Rocky graced the stage for Jeremy Scott’s afterparty, feting their Adidas shoe collabo after hitting the #FROW with his girlfriend, supermodel Chanel Iman. While Scott’s best known for hawking colors, the neons of his collections didn’t sway the Uptown rapper. 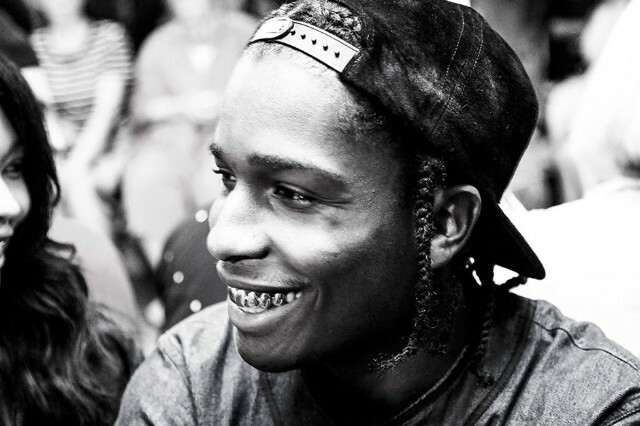 Rocky, as ever, wore all black—a steez that accompanies no particular era.